When you think about John Joubert’s music you might home in on his choral works primarily, or the many operas including the latest example ‘Jane Eyre’ recently released on Somm. You might know the two symphonies from the recordings on Lyrita and Dutton but the organ may not come immediately to mind. Indeed the complete works don’t quite make an hour’s worth of music but these works do represent the composer in all of his facets and skills. In addition they are spaced across his long career from the 50’s into 2004. And there is a consistent voice during these six decades, a voice that you recognise but which is highly individual. 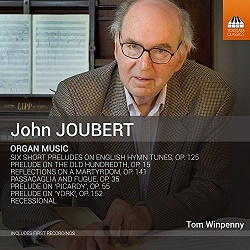 On a personal level I have known John for 35 years and his music ever since I was a boy, I have purchased many scores and studied much of his music I have also played some of these (of the more straightforward) organ works. For example the Prelude on Picardy Op. 55 can be purchased in an OUP collection entitled ‘Easy Modern Organ Music’ Volume 2. Picardy by the way is ‘Let all mortal flesh keep silence’ a plainchant used as a hymn and often sung during Passiontide. Joubert clearly likes this modal and ancient melody because another version of it appears in the Six Short Preludes on English Hymn tunes composed for chamber organ without a pedal board. Of the other pieces one is based on the Old Hundredth and is an adaptation of Joubert’s Op. 15 Prelude for full organ. Of especial interest is one based on Mon Dieu prête-moi l’oreille which Joubert might have especially come across in his youth in South Africa but which is better known ‘Virgin born we bow before thee’ it acts as a sort of contrasting scherzo in the set. The first major work is the Passacaglia and Fugue. This was brought out on an LP back in 1972 and recorded at Bury St. Edmunds by Harrison Oxley for RCA. The fugue subject uses the interval of the seventh (rising initially) and the fifth (falling), these two intervals as well as the perfect fourth are Joubert trademarks. For example the Three Portraits Op. 97 begin with a falling and rising seventh followed by a falling fifth, but examples are legion throughout his work, and it's interesting how in each piece they create a different effect either emotional or in this case, technical. The fugue is built around a lengthy angular subject and its counter subject is a mix of rising and falling semiquavers. The whole is developed in detail and builds in mood. I have found it very curious that so few organists have taken it up although it is technically very demanding. It's particularly pleasing that the booklet notes, which not only includes ‘A Biographical Outline’ written by Tom Winpenny but also ‘A Note’ by the composer himself about the background to his organ works and his early life in the Anglican church music tradition and Winpenny also contributes an essay on each of the pieces. But there is also a detailed history and specification plan of St. Albans’ Harrison and Harrison four manual organ recently restored and rebuilt. Of the highlights in the choice of stops, I like the idea of a Grand Cornet on the Great and the Fanfare trumpet on the solo organ. These are not exploited by Tom Winpenny to any great degree but the variety of possible sounds otherwise is most exciting especially in the Reflections on a Martyrdom Op. 141 especially written for the St. Alban’s organ. The title of course was informed by the city’s fame as being a Roman town where St. Alban became the first British martyr. The work falls into four connected movements. It begins with cluster chords and rapid passagework, a fanfare figure possibly utilizing the stop mentioned above and massive dramatic chords this movement is entitled ‘Recitative’ – Alban's trial before the Roman magistrate. The following movement –called ‘Aria’ which is gentle and melodic is Alban’s prayer for acceptance into the Christian faith. With movement 3 we are led straight into the place of his execution with a funeral march and followed by (4) a beautiful description of the resultant free flowing waters and flowers created at the site of the martyrdom, music which uses ideas from the preceding sections. The remainder of the CD consists of miniatures, the sort of piece one might play before or after the service, indeed one piece is entitled Recessional and is of an appropriately noble and rejoicing quality for the end of a festival service. I would be quite sure that the composer, who was 90 only a few weeks before this CD emerged, will be absolutely delighted by Tom Winpenny’s performances and clearly demonstrated understanding of the requirements needed to make this music sing. In addition Toccata can always be relied upon for its excellent documentation of just the right length, the right font size and the right technical language, also the standard and clarity of its recording process. A very useful and fascinating release especially for anyone with an interest in modern organ music.